AUTO](VC): Limit Break 4 (This ability is active if you have four or more damage): [Choose two of your «Gold Paladin» rear-guards, and put them on the bottom of your deck in any order] When this unit attacks, you may pay the cost. If you do, choose up to two of your «Gold Paladin», and those units get [Power]+5000 until end of turn. 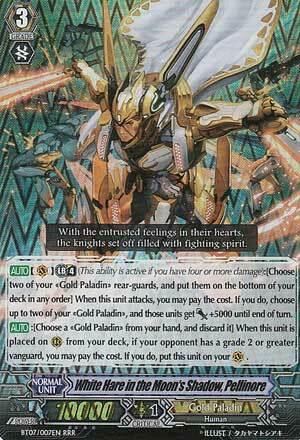 [AUTO]: [Choose a «Gold Paladin» from your hand, and discard it] When this unit is placed on (RC) from your deck, if your opponent has a grade 2 or greater vanguard, you may pay the cost. If you do, put this unit on your (VC). Starting off this week, we’re jumping ahead all the way to Set 7 and reviewing the super-fast leader of the Gold Paladin’s White Rabbit Corps. Just to note, the rabbit is my favorite animal, although this particular rabbit isn’t fluffy or cute. Pellinore seems to be a rather controversial and hated card, for his very design promotes and rewards large strokes of luck. Personally though, I believe that Pellinore is a rather mediocre card because it’s difficult to make full use of his first skill, and his second skill generally pales in comparison to that of his colleagues Garmore, Spectral Duke, and Ezel. The first skill is Soul Saver Dragon-lite, but not nearly as powerful, and the cost makes it seldom worth doing outside of an endgame push for damage. Limit Break is hardly a limitation for this, because it’s unlikely you’ll even want the skill before high damage. By putting 2 rearguards in the bottom of the deck, you can distribute 10,000 power amongst your units. This can make the difference between victory and defeat, but if you use it too early, the loss in card advantage can be crippling. The combination of Pellinore’s defensively-weak 10,000 base power, his inability to gain power without his skill, and the fact that his skill is only at all useful endgame makes it a rather poor initial ride. For this reason, Pellinore is often used alongside Garmore, who is a fantastic ride and instantly can set off the skills of the other members of the White Rabbit Corps. The second skill is pretty much what makes Pellinore, Pellinore. When called to a Rearguard circle from the deck, you can discard a card to move him to the Vanguard slot. Decks that use Pellinore should have many cards that calls units in the middle of the Battle Phase, and that can also take advantage of being called from the deck, such as Spring Breeze Messenger, Lop Ear Shooter, Listener of Truth, Dindrane, and Player of the Holy Bow, Viviane. It is virtually never worth using Pellinore’s skill in a Main Phase if you ever get the chance to, because you’re sacrificing a card from your hand and Pellinore as a rearguard in order to have a subpar Grade 3. However, if Pellinore is rode in the Battle Phase after the Vanguard has attacked, Pellinore comes standed and can procure another Twin Drive to replace the loss in advantage, as well as whittle down even more of the opponent’s cards: this is very much worth doing, and this technique is Pellinore’s saving grace and the greatest play a Pellinore-using deck can make. Sure you might add on some extra pressure but that requires you to both superior ride consistently AND do it at a time where it will help you most, which is late game, which is something of a contradiction because the later the game gets, the less consistent Pellinore gets. Secondly, his other ability isn't all that amazing either. When you break it down into base game concepts (which you should do everytime when looking at a card), It's +5000 for -1. Sure you get to choose your targets but when comparing it to the likes of Garmore or Ezel, who get +5000 for a mere condition rather than a cost, practically costing nothing. It could be argued that Pellinore can grant the power bonus to rearguards because people usually don't guard the Vanguard however by nature of being a Limit Break you're already in the late game where people have the guard the Vanguard, so again Ezel/Gamore are simply more cost efficient and don't have to force you to sacrifice necessary shield or offense for what is a mere temporary bonus. It could also be argued that Pellinore clears the field for cards like Player of the Holy Bow, Viviane who superior call something when they hit a Vanguard but again the same damn problem, it's a Limit Break, it's late game and they just won't let it hit, even if they did let it hit more often than not, they've probably just lost. At most, you would get one single extra superior call from Viviane and friends during late game. So yeah, Pellinore is basically a Limit Break who doesn't want to be a Limit Break. All of it's abilities are AT BEST break evens and don't create any noteworthy advantage. White Hare in the Moon's Shadow, Pellinore commands the White Rabbit division of the Gold Paladin Clan, and serves as something of a mid boss and miraculous turnaround card for Aichi Sendou in the second season of the anime. Notably, Pellinore can 'hop' into the Vanguard Circle under the correct conditions. First and foremost he must be placed on a Rear-guard Circle from the deck, but how does one go about this? Well, there are few options. Spring Breeze Messenger is one of the many Gold Paladin First Vanguard options, who's successful boost lets one trade it for a Gold Paladin amongst the top 3 cards of the deck. No Pellinore? No problem - Lop Ear Shooter may make an appearance along the way, who's ability similarly triggers when called from the deck. By dropping a card, another call is made from amongst the top 3, causing a potential stream of troops to spew forth, albeit in a slightly awkward manner. And let's not forget the (albeit slim) chance of cards such as Viviane and Nimue being able to pull off a desirable top call! Provided Pellinore comes into play properly, the only other requirement for him to make his move is for the opponent to have a Grade 2 or higher Vanguard. Should this be the case, even if you're somehow sitting at Grade 1, the drop of a card lets Pellinore take charge, ready to attack again after he changes circles. Thanks to the extra attack and drive checks provided by the move, the even exchange of card presence tends to turn into an advantage. Pellinore's Limit Break ("Moonlight Energy Raise") sends two rear-guards to the bottom of the deck in order to grant two units a bonus 5000 power for the turn when he attacks. This tends to be an equivalent exchange that causes the opponent to drop 2 additional cards, matching your loss, and since it doesn't require any counterblasts, the rest of the deck is free to use them for whatever purpose you see fit (ideally, power buffs for Battlefield Storm, Sagramore and/or Sleygal Double Edge). Be careful with the division of power and timing, though! Perfect Guards can really ruin Pellinore's day.